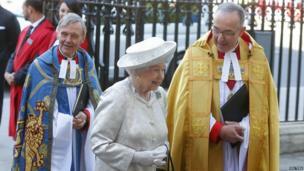 The Queen attends a service at Westminster Abbey to mark the 60th anniversary of her Coronation. 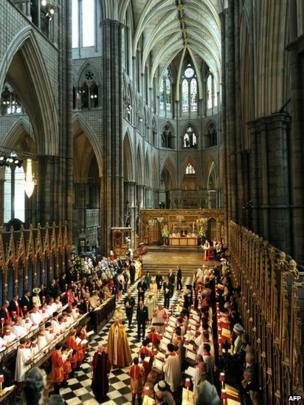 A service at Westminster Abbey has marked the 60th anniversary of the Queen's Coronation. 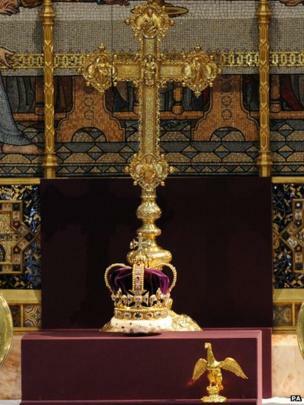 The solid gold St Edward's Crown, used at the Coronation in 1953 and kept in the Tower of London, was displayed on the High Altar to mark the occasion, alongside the Ampulla, the gold, eagle shaped-bottle which held holy oil for the Queen's anointing. 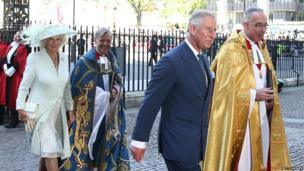 The Queen entered the service alongside the dean of the abbey, Dr John Hall, and followed by the Reverend Dr Robert Reiss, Canon of Westminster. 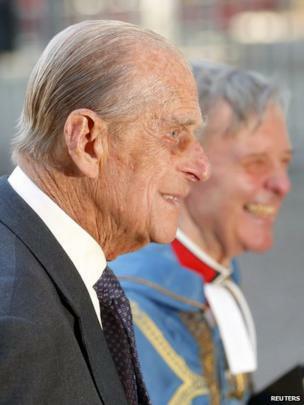 The Duke of Edinburgh, who pulled out of an engagement on Monday night because he was feeling unwell, also accompanied the Queen as she arrived at the abbey. Prince Charles, next in line to the throne, was just four when his mother was crowned at the abbey in 1953. 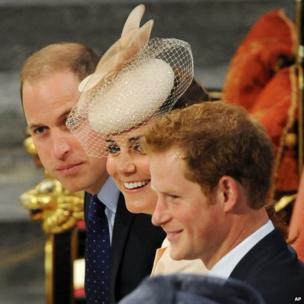 Prince William was accompanied by his pregnant wife, the Duchess of Cambridge, and his brother, Prince Harry. 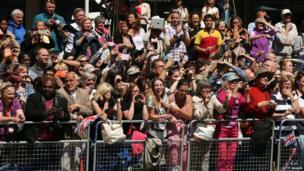 Crowds gathered in bright sunshine outside the abbey where. 60 years ago, the Queen's well-wishers endured wetter weather. Prime Minister David Cameron recalled an earlier coronation in a reading from the Book of Kings: "The people piped with pipes, and rejoiced with great joy, so that the earth rent with the sound of them." 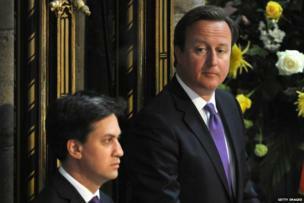 The PM was seated in the abbey next to opposition leader Ed Miliband. 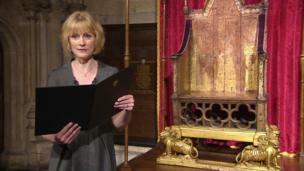 A poem, written by poet laureate Carol Ann Duffy especially for the occasion, was read by actress Claire Skinner as she stood alongside the newly restored Coronation Chair. "The crown translates a woman to a Queen," the poem began. It went on to echo a line from the Queen's 21st birthday speech: "My whole life, whether it be long or short, devoted to your service." 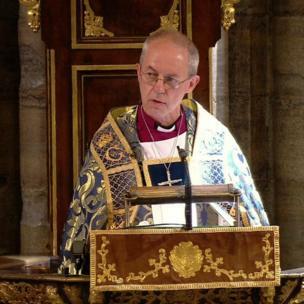 The Archbishop of Canterbury, the Most Reverend Justin Welby, said the 1953 Coronation ceremony had been marked by: "Pomp and ceremony on a rainy June day, all so very British, wrapped in time and custom." The choir sang William Walton's setting of Te Deum Laudamus, composed for the Coronation, as the Queen's procession left the abbey.